The 1100 Club has been shortlisted in the 'Outstanding Online Presence' category for the National Car Club Awards to be held on 23 March 2019. This category considers our work on social media and also our club website, with its increasing technical content for members and of course its comprehensive set of Idle Chatter magazines with searchable database of content. 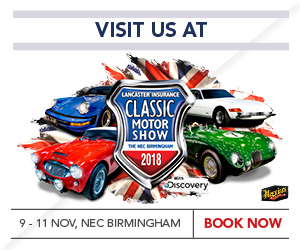 We are very pleased to announce that for the first time ever, the 1100 Club will have a stand at the Practical Classics Classic Car & Restoration Show in March, with some live restoration action while we are there! Make sure you visit us at stand 440 in Hall 5 at Birmingham’s NEC during Friday 22 – Sunday 24 March 2019. 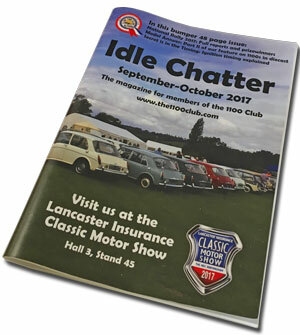 1100 Club members can purchase discounted tickets using the advert and code in the latest issue of Idle Chatter or from the logged in area of the 1100 Club website. 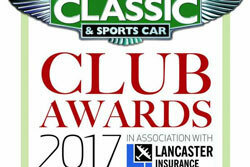 After being highly commended for the last four years, we've finally done it - Idle Chatter was awarded 'Club Magazine of the Year' at the glitzy Classic and Sportscar Club Awards at the NEC on Nov 9. 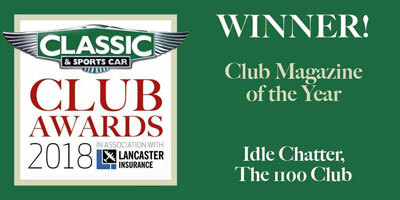 We are absolutely delighted, and would very much like to thank Classic & Sports Car magazine and Lancaster Insurance Services for the award, and of course all of our members who have supported Idle Chatter with articles and features large or small. The 1100 Club stand will, as usual, display several stunning variants of the marque, including a concours 1300GT from Ireland, a Morris Mk II and what must be one of the best Vanden Plas Princess examples in the country. Also as usual, the full range of club regalia will be on sale and the stand will be staffed by some of the most knowledgeable and friendly car enthusiasts in the business. But our centrepiece will be something even more special still - you will have to visit us on Stand 485 in Hall 3 to find out what it is, but we can reveal that it will involve a chance to get 'up close and personal' with an A Series. 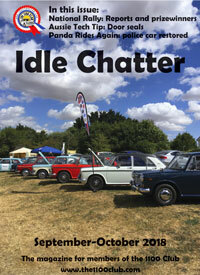 The September-October issue of Idle Chatter has been hitting UK doormats, so will be with our overseas members and on the website for web-only members shortly. It's been a while since the last issue, as it was out early for the National Rally, but hopefully this one is worth the wait. In this issue we have a full National Rally report, alongside a photographic celebration of all our concours prizewinners. Other highlights include details of our 2019 Calendar Competition in which existing members can win a free membership renewal (which will also be on Facebook this week), Dippy rides again (although sadly rather lop-sidedly this time), Phil Rixon visits Tanya Field's Cowley Display and archivist talk, and we tell the story of Terry Wells' against-the-odds police panda car restoration. In our technical section, we look at clutch drag, Derek shares a simple tip for making bonnet rehanging much more straightforward, and our Aussie Tech Tip concerns the rather different door seals that were fitted to the Australian cars. As usual we have lots of news and views, area updates and five inspiring running reports profiling what our regular contributors have been doing with their cars in the last couple of months. Not a member? It's never too late to join us (and we've saved you a copy). 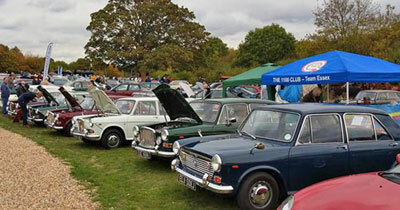 Over 220 cars turned up to the BL Autumn Rally at Milton Keynes in September marking the end of the show season. 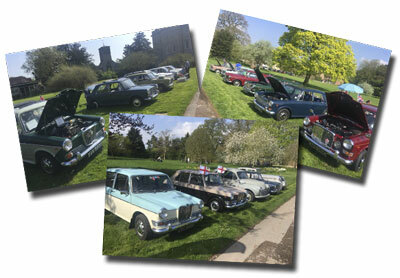 And thanks to The 1100 Club's ‘Tea-m Essex’ at least nine ADO16s were on display - even an Austin Apache - and all the usual fun and games! The show was impressive, with more cars than ever before - great work from organiser Tom Morley. The 1100 Club National Rally was held at the Epping Ongar Railway and, despite variable weather, more than 30 1100s visited during the weekend. It was hard to keep track as many members took the chance to take their cars on a tour of the picturesque Essex countryside around Epping. The Saturday evening meal aboard the Epping Fryer heritage train was enjoyed by around 100 members and their guests. We had a lovely sunny day for our Spring Show at the new location for 2018 of Waterperry Gardens, Wheatley, Oxfordshire. A good turnout of members made the most of Drive It Day (April 22) to join us and enjoy the interesting venue. 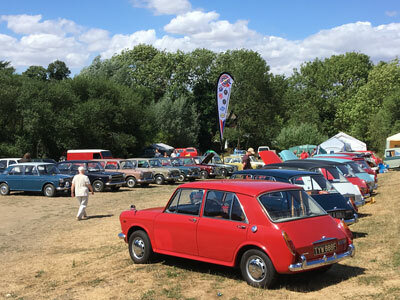 It was a good chance for old friends to meet up for the first time in the new season, and also to welcome some new members into the fold - at least two of the cars present were driven by people who had never attended an 1100 Club event before! The 1100 Club is delighted to report that we have been able to secure the purchase of the tooling held by Earlpart Ltd for front wings and rear subframes. We hope that this will allow us to continue to supply our members with high quality wings and hopefully move towards rear subframe remanufacture when the time is right. UPDATE: We have sold recently five more wings from our stock! The 1100 Club was shortlisted in the 'Outstanding Online Presence' category for the National Car Club Awards, and at the event held on 24 March 2018 was 'Highly Commended'. We are very pleased to say that we are ending 2017 with more members than we have had for many years - delighted to have you with us! Don’t forget to renew your membership before 18th January 2018 to receive your Jan-Feb Idle Chatter on time. You can do that using the details in the magazine or on this website. Our renewal rates for 2018 are now available and any renewals or new memberships received will ensure membership lasting until the end of 2018. Overseas members: following a review of our overseas membership rates and changes to several of the factors that influence them, rates will be significantly reduced for 2018. 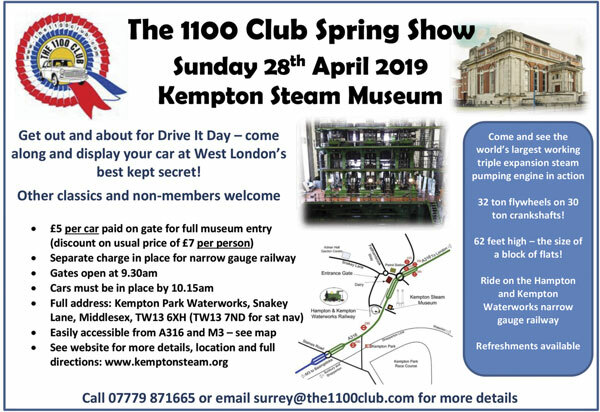 This year's show was hugely successful for the 1100 Club, with a number of new members joining on the spot, regalia (especially our unique books) selling well and, most importantly, a constant stream of visits from members from up and down the country. We do hope you enjoyed our display if you visited us at the show - thank you for coming to say hello! 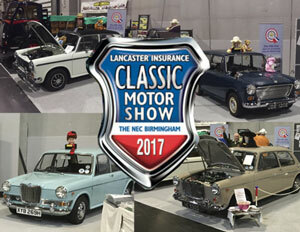 We were delighted to get an honourable mention TWICE in the Classic and Sportscar Club Awards at the Lancaster Insurance Classic Motor Show at the weekend. Idle Chatter was highly commended for the fourth year in a row, and for the first time our website and our social media presence were also recognised! Congratulations must go to the winners in each category, of course, but it was still great to be noticed by the judges in both. 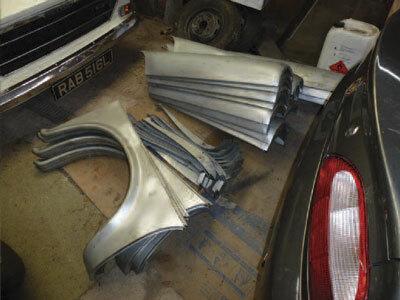 Following feedback and suggestions from members, the 1100 Club has invested in twenty offside front wings from Earlpart. Wings are incredibly difficult to make well, and since Earlpart is the only official source for these wings at the moment, we have decided to future-proof their supply. They are currently still in three parts, although if you were prepared to collect a wing rather than have it posted, we could probably arrange expert assembly for you. The other plus of the process is that, having purchased in bulk, we can offer these offside wings to 1100 Club members at a very good price. If you're not a member, why not join us? A wing purchase from us could save you more than the cost of a subscription. 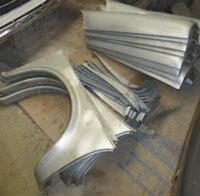 The 1100 Club also has significant stocks of nearside wings, so a pair can be supplied if required. You can find out more from our Spares Advisor - contact details on page two of every Idle Chatter. In this biggest ever 48 page issue, we have news and reports from the National Rally, including this year's prizewinners, area updates from a busy summer and, as usual, a variety of interesting and inspiring running reports, with a couple of new faces to the feature. We bring you Part II of the 'Model Answer' diecast 1100s article and explain in detail how your ignition timing works and how you can affix your GT side trim if you can't get hold of the proper trim clips! This year the Club had 15 cars on display at Peterborough and won the award for Best Club Stand for the second year running! Our 2017 National Rally took place across the weekend of 29th and 30th July at Mapledurham House, near Reading. It celebrated 50 years of the Austin-Morris Mk2 and, despite the variable weather, some 40 cars made an appearance during the weekend.